"Seeing what could have been, what will never be for us or for Morgan, is not as much as the pain of emptiness of Morgan being erased and negated by the person who murdered her," mother Gil Harrington said. But Morgan Harrington has not been negated. Since her death and in her name, a school has been built in Africa, scholarships created and laws championed. Now, with her classmates, she is also remembered. Making a special presentation was one of Harrington's professor's, Dr. Jane Lillian Vance. Part of that presentation, Morgan's own words from an essay Harrington asked Vance to safeguard before her death. All leading up to a moment in the spotlight that should have been for a beautiful, young, intelligent 22-year old getting ready to conquer the world. "It's a sad day for us to be here and see the young kids and see the families and see people celebrating," Father Dan Harrington said. Instead, a posthumous diploma left to her grieving father, who knows that once the applause quiets down, this chapter will end with a new, unknown chapter primed and ready to begin. "This is a way for us to mark what her graduation would have been. For us it's sad. It's one more loss that we mark as we move forward and try to find the person who killed our daughter," Dan Harrington said. "The most important person in my life: My mother. A lock of her strawberry blonde hair is nestled deep center of my shrine as the relic because I love her so much and strive to be more like her," Jane Lillian Vance said. Blacksburg, VA - The Virginia Tech/Carilion School of Medicine and Research Institute is kicking of its humanities efforts Wednesday as they host an art show. The show features a variety of local artists, including a number of high school students. The goals are to give artists a market to sell their work and to allow students and faculty a way to get to know the community better. All of the artwork, except for the Harrington work, is for sale. accord. Instead, I find that the emotions fester. I know it is air and light that retards infection and decay – so I will start. 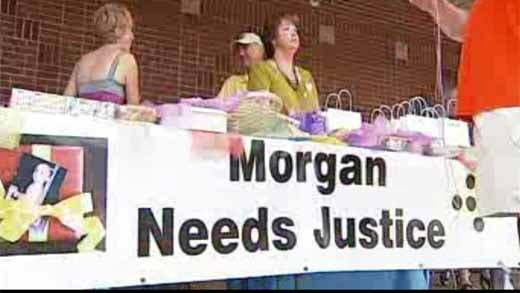 A group called "Justice for Morgan" says that's exactly what they want for Morgan Harrington. The group held a fundraiser Saturday for the 20-year-old Virginia Tech student who was killed in 2009, to raise money and keep the victim's name in the public conscience. A group in North Garden says that they want "justice in June" for Morgan Harrington. Harrington is the 20-year-old Virginia Tech student who was murdered in 2009, her body was found months later on a remote farm in Albemarle County. The group of supporters calling themselves "Justice for Morgan," gathered in North Garden on Saturday, just three miles from where Harrington's remains were discovered in January 2010. The group is raising money for the Morgan Harrington Educational Wing that is currently being built in Zambia, Africa by her mother Gil Harrington. Zambia is a place dear to both Harrington and her mother, who frequently travels there as a nurse. "The outside is nearly completed," says group member Kenny Jarels. "But we need work to be done on the inside." The group hopes that by selling T-Shirts, bracelets and taking donations, they will reach their goal of $15,000. Morgan Harrington was only 20-years-old when she vanished from a concert outside the John Paul Jones arena in Charlottesville, VA. It was October 17, 2009 when she was separated from friends around 8:30 p.m. They say she walked out of the front entrance of the Metallica concert. Authorities say Morgan called her friends inside and told them she was finding a ride home, and that they shouldn’t wait for her. State police officials report Morgan was last seen by the ticket office on the University Hall side of the building and witnesses report seeing her hitchhicking close to the arena exit road. An intese search of the area yielded no new clues until three months later. In January 2010, tMorgan’s body was found on a farm in Albemarle County, Virginia. Investigators said her body could have been on the land as many as 100 days. Last summer, investigators released shocking information. They said the man who may have killed Morgan could be the same suspect that committed a sexual assault against another female in 2005. Virginia State Police officials confirm there is a forensic link between the 2005 assault and the murder. Last week 20-year old Indiana University student Lauren Spierer went missing after leaving a bar and walking toward home alone. But according to the school newspaper, a security camera at her apartment complex shows she never made it back. Lauren hasn't been found yet despite a massive search effort—both in the area and online, where friends and family are using social media to get the word out. It's a similar story to that of Morgan Harrington, the 20-year old University of Virginia student pictured here who vanished from a concert and whose story is below. We hope that Lauren's story ends very differently from Morgan's. All of the money from that fundraiser will go toward building a school in Africa in honor of their daughter. The Harringtons want to make sure people remember that Morgan's killer is still at large. "We don't want any more blood spilled by the person who killed our daughter. We don't want any other families to feel this anguish. So it's as important to us to fund raise as it is to make people aware and keep asking for tips," said Gil and Dan Harrington. The “Help Find Morgan Dana Harrington” Facebook group is in danger of losing its more than 30,000 members as the social network giant changes its groups format. Denise Sparks, an administrator of the group, said she has tried to contact Facebook to prevent the group from being “archived” as it moves to the new format. According to Facebook’s page on group migration, an archived group will re-emerge in the new format, but the members would have to be added again. Twenty-year-old Morgan Harrington walked out of a Metallica concert last October and disappeared. Her friends and family’s ultimately heartbreaking search reveals why so many missing women are never found. Morgan Harrington was so excited about the October 17, 2009, Metallica concert at the University of Virginia (UVA) that she went through three outfits that morning before settling on a miniskirt, Pantera tee shirt, and leggings with boots. At 20, Morgan, a junior at Virginia Tech in Blacksburg, had already been to a few concerts at UVA, two-and-a-half hours away in Charlottesville. Her 22-year-old brother, Alex, had gone to school there, and she and her friends would sometimes go to a show then crash for the night on his floor. The habit of joy is so easily forgotten and most difficult to recapture. We have definitely lost our way on this – we have got the work side of the equation down solidly, but the pleasure/reward part is missing since your murder, Morgan. I believe that the way out is to add the grace notes, wherever possible and to guard the space where contentment might grow. Exuding joy into your life is like the letting down of milk; it cannot be forced, but creating an environment of serenity allows the nurture to flow. We need to pay attention to this process and help it along. Otherwise, I fear we are at risk of essentially becoming collateral victims of Morgan’s killer, alive, but without a life. No way, no how, will I let him inflict further damage to us; we will work it out. I happened on a phrase that resonated and that I want to create for our triangulated family: “post traumatic growth”. It IS possible – it even has a name! Morgan help us conjure this reality. One year ago today, the Virginia State Police released a composite sketch of a man forensically linked to the disappearance and death of Virginia Tech student Morgan Harrington. Authorities are still trying to ID the suspect, and ask for the public’s continued help in doing so. Harrington, 20, of Roanoke, went missing the night of Oct. 17, 2009 after attending a Metallica concert at John Paul Jones Arena, located on the University of Virginia campus in downtown Charlottesville. Her remains were discovered Jan. 26, 2010 in a field on Anchorage Farm, a rural 700-acre property in southern Albemarle County. Police are investigating Harrington’s death as a homicide. It was one year ago Friday, that Virginia State Police went public with a composite sketch of a man forensically linked to the disappearance and death of Virginia Tech student, Morgan Harrington. The public is still encouraged to contact any of the following agencies with information related to the cases. Friday marks one year since Virginia State Police released a composite sketch of a man who was forensically linked to the disappearance and murder of Roanoke County Virginia Tech student Morgan Harrington. The sketch came from an unsolved 2005 abduction and sexual assault case in Fairfax. The victim gave police a description of her attacker. A DNA match linked that case with Harrington's. "Since this composite sketch was released last year, state police investigators and Fairfax City investigators have received several hundred new tips on this individual," said Lt. Joe Rader, Virginia State Police Bureau of Criminal Investigation's Appomattox Field Office in a news release. "This is extremely encouraging as the information we get from local citizens is important because they are the most familiar with the surroundings and habits of their neighbors and associates. We still get information on a daily basis and prioritize that information for follow-up based on what appears to be most relevant to solving the case." A year has passed since the Virginia State Police released a sketch of a man, who was forensically linked to the disappearance and death of Virginia Tech student, Morgan Harrington. The City of Fairfax released a sketch of a man from an abduction and sexual assault case in 2005. The Virginia Department of Forensic Science confirmed that the DNA matched, connecting the two different crimes. According to Virginia State Police, the composite sketch brought in hundreds of new tips on the invidiual at large. The public is still encouraged to contact either agency with information related to these two active cases. Those with information about the man in the sketch may contact City of Fairfax Police Detective Mike Boone at 703-385-7959 . Anyone wishing to provide information in the Morgan Harrington case is encouraged to call the Jefferson Area Crime Stoppers at 434-977-4000 or Virginia State Police at 434-352-3467 or email at bci-appomattox@vsp.virginia.gov. A reward of $150,041 is still available for anyone with information that leads to a successful resolution of the Harrington crime.